I am a big fan of this book because it really delivers on flavour. Admittedly I usually use a pressure cooker not a slow cooker but in all cases I have really felt I have learned something about which chiles to use and to broaden both my palate and my knowledge of Mexican food. Yes, it takes a lot of forward thinking to buy 4 different chillies, epazote and specialist beans online for the typical recipe but so far it's been worth the effort. I pulled this book off the shelf last weekend and my first impression was disappointing. Almost every recipe called for another recipe in the book and sometimes, several other recipes. No estimated cooking time to prepare the entire combination of dishes is provided so to figure this out you need to flip through the various recipes to see how long it will take you to actually make a dish. As an example, the Burrito El Guero's list of ingredients includes Frijoles Puercos and Shredded Beef or Chorizo y Papas in addition to several other items. Looking at the Frijoles Puercos recipe you'll find it calls for 1/2 cup of shredded Carnitas (yes another recipe) which thankfully doesn't include an ingredient requiring yet another recipe but, it does take approx 9 hours to prepare. At this point I realized it would take days to make the burritos and totally lost interest. This book will most likely be placed in the donation pile. I think maybe the wrong recipe got pulled in here... the Pozole rojo recipe in this book does not contain any beef, only pork, and no veggies like carrots (only onion and garlic). 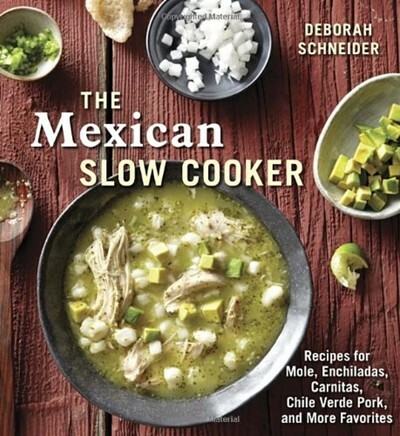 In any case, the Pozole rojo from this book is really tasty. Be sure not to skimp on your toppings! They add a fantastic crunch. This was borderline too salty, but otherwise was pretty tasty for what is basically a dump and cook slow cooker recipe. I didn't have banana leaves and I did miss their flavor. The sauce was a bit grainy, maybe because I used homemade achiote paste. I made this because I needed to use up some chorizo. It was pretty tasty. I used about half of the chile de arbol but I would use the whole amount next time because it wasn't too spicy. Even with the potatoes, it needs another starch (tortillas or rice) since it is pretty saucy. The picky instructions on how to layer the ingredients can be ignored since you are supposed to stir periodically anyway. This has become my go-to "chile con carne". I've made it in the slow cooker and just as successfully in the pressure cooker. The addition of the pork hock delivers bags of flavour. Following Heston Blumenthal I add a few star anise to intensify the beefy flavour. It makes a lot and freezes well.